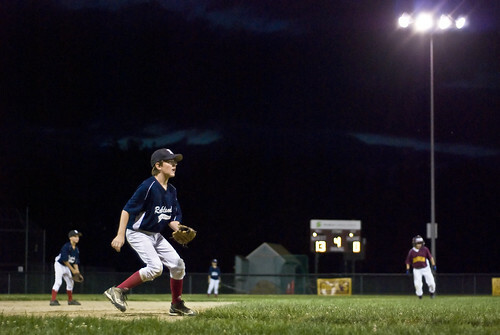 The Hot Corner, Under The Lights (174/365 year 3) – Annoyingly Boring? Sunday night baseball. My son’s team picked up a much needed victory under the lights. That opposition player you see in the maroon and gold? Moments later, he was tagged out at third by my boy while trying to advance on a passed ball. And with this post, I am officially all caught up! Whoo hooo! I like the moment and lighting very much. The player (your son?) really stands out.